There are 9 Assisted Living Facilities in the Weirton area, with 4 in Weirton and 5 nearby. To help you with your search, browse the 7 reviews below for assisted living facilities in Weirton. On average, consumers rate assisted living in Weirton 5.0 out of 5 stars. Caring.com has helped thousands of families find high-quality senior care. To speak with one of our Family Advisors about assisted living options and costs in Weirton, call (855) 863-8283. The city of Weirton, West Virginia is centered mostly in Hancock County, but certain neighborhoods within it are also considered part of Brooke County. The town has a sizeable senior population — an estimated 37 percent of the 19,307 residents are 55 and older. Elderly residents considering assisted living care are provided a wealth of options, including four local assisted living facilities and 24 more located in nearby towns. The Department of Health and Human Resources, Office of Health Facilities Licensure and Certification regulates each facility to ensure seniors live a happy, healthy life. The Weirton area has a cost of living that is scored at an 82, which is 18 points less than the national average of 100. Seniors looking into assisted living may not benefit from the lower expenses, however, since housing costs have the most significant reduction. When compared against the national averages, grocery costs are on par, health care costs are slightly less expensive and the cost of transportation, utilities and miscellaneous goods are more expensive. While summers in Weirton can reach temperature highs at around 83 degrees Fahrenheit, seniors may be pleased to know that humidity levels rarely exceeding 39 percent. Seniors may not like winters in Weirton since they can be quite cold, with temperature lows averaging between 22 and 32 degrees Fahrenheit. The city of Weirton scores a 47 on the air quality index, which is only slightly better than the national average score of 50. However, the air quality index is significantly better than the state's air quality index of 126. Seniors concerned about security might appreciate Weirton's low crime rates. The city's overall crime rate is 57 percent lower than the national average, making it safer than 75 percent of U.S. cities. The Weirton area is home to world-class facilities, including Weirton Medical Center, in the event of medical emergencies or illness. Weirton has an array of community resources for seniors, including the Weirton Senior Center, an organization that assists seniors with living a better lifestyle through programs, recreational activities and day trips. Assisted Living costs in Weirton start around $0 per month on average, while the nationwide average cost of assisted living is $4,000 per month, according to the latest figures from Genworth’s Cost of Care Survey. It’s important to note that assisted living rates in Weirton and the surrounding suburbs can vary widely based on factors such as location, the level of care needed, apartment size and the types of amenities offered at each community. 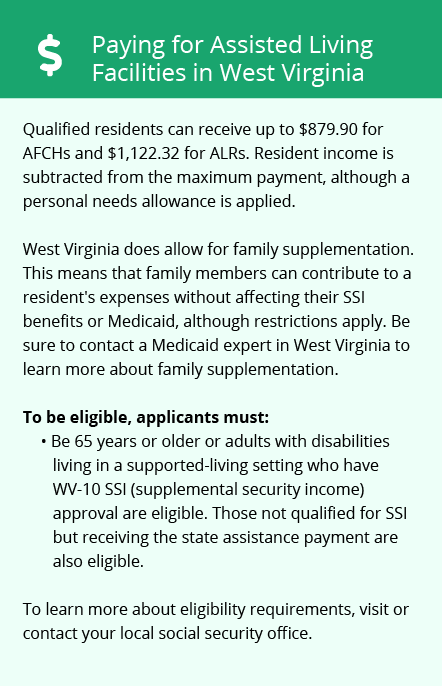 Weirton residents do not have access to Medicaid assistance for assisted living. However, seniors may qualify for aid through Supplemental Security Income (SSI) or a special needs circumstance waiver. Learn more about these programs, plus who’s eligible, on our Assisted Living in West Virginia page. For more information about different ways to finance assisted living, visit our Assisted Living in West Virginia page. Weirton West and the surrounding area are home to numerous government agencies and non-profit organizations offering help for seniors searching for or currently residing in an assisted living community. These organizations can also provide assistance in a number of other eldercare services such as geriatric care management, elder law advice, estate planning, finding home care and health and wellness programs. To see a list of free assisted living resources in Weirton West, please visit our Assisted Living in West Virginia page. 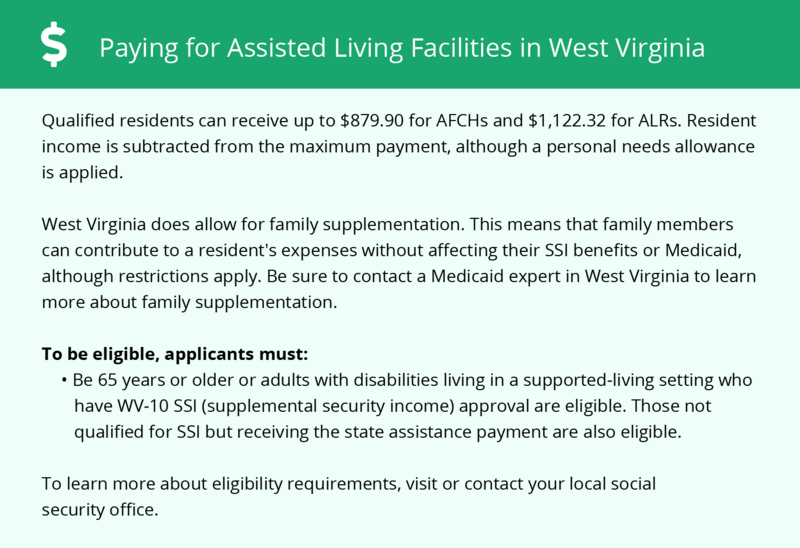 Weirton West-area assisted living communities must adhere to the comprehensive set of state laws and regulations that all assisted living communities in West Virginia are required to follow. Visit our Assisted Living in West Virginia page for more information about these laws.